With magnificent views over the historic city of Pistoia, within easy reach of the Tuscan capital Florence, Villa Martinelli is perfectly placed to relax by the pool and take time to visit the treasures of Tuscany. Villa Martinelli is in the small village of Valdibrana, noted in Tuscany for its production of delicious olive oil. The house is in a beautiful olive grove, producing some of the best oil in the area. The apartment is newly renovated, with a double and a single bedroom. The location above Pistoia ensures that the air is always fresh, and there is air conditioning for when the weather becomes hot. A fine private pool makes this a very desirable, great value holiday property. There is a restaurant nearby, and the city is easily accessible in a few minutes by public transport. Nearby Florence is easily reached by car or train. Your hosts Stefano and Beatrice will make sure that your stay with them is peaceful and relaxing. Stefano produces what is considered by locals to be the best olive oil in the area, and he is also head chef at one of Tuscany's top restaurants. Villa Martinelli is neighboured by 1 bedroomed Homeaway listing 8948536 only 50 metres away. We can help arrange mountain biking, hill walking, horse riding, gorge walking, art classes and cooking classes. air condition measured and charged at the end of your stay. The kitchen has a dishwasher, hob, oven, fridge and freezer. The washing machine is in an outhouse. Outside: The 10 metre private swimming pool for sole use of the apartment. There are sun beds and deck chairs. Utility Room: Contains washing machine Cleaning / Towels / Linen / Maid service: Towels and linen are included. Another double bedroom and kitchen is available exclusively to the main apartment. Ask for details. We spent the second week of our holiday at Villa Martinelli and it was fantastic. The apartment is simple but comfortable and the pool was lovely. The best part is the location as its only 5KM to Pistoia, a really cool city with loads of restaurants and shops, and only 30 minutes to Florence. If anything we preferred Pistoia to Florence! Stefano and Beatricce were so nice and gave us eggs and tomatoes. We also bought some olive oil that they produce. Delicious! Siamo stati accolti in maniera fantastica da Stefano e Beatrice, casa pulita, panorama stupendo e posto molto tranquillo dove rilassarsi. Vacanza indimenticabile. Alfredo B. A wonderful wonderful holiday. I would like to book to return next year! We'd highly recommend this property. The location is convenient - a short distance from Pistoia - and the house is set amongst olive trees with terrific views down the valley. It was very peaceful and we were made very welcome by Beatrice and Stefano who regularly left us 'gifts' of eggs, biscuits and olive oil - Stefano makes his own and has won prizes. We were there during a heat wave and Beatrice responded quickly to our concerns about sleepless nights by buying additional fans for the bedrooms. The family were superb hosts, allowing us privacy but always there if we needed something. With temperatures in the high 30s, we needed the swimming pool and made good use of it. This is a beautiful part of Tuscany and we had days out in the mountains as well as Pisa, Lucca and Pistoia itself, Italy's city of culture for 2017. Florence is not far and trains run from Pistoia. We had a delightful holiday. Thank you for the lovely review. We will pass it on the Stefano and Beatricce, who will be delighted. Stefano and Beatrice are fantastic guests and love to share their Tuscan produce with their guests. We would love to welcome you back to Tuscany, and can offer you a returners discount. Thanks again and we look forward to welcoming you back to Tuscany. Fantastic Location – A Slice of Tuscan Fried Gold! Sitting in the hills above Pistoia, Villa Martinelli is an excellent base for exploring the local area and beyond. Split across two floors, the Villa has an open plan kitchen, dining and sitting area with double doors providing access to the outside terrace dining area. The kitchen is well equipped and met all our needs for the 2 weeks of our stay. The only access to the upper floor is via a narrow metal spiral staircase that may prove a challenge for anyone with mobility issues. The main bedroom is spacious and there is plenty of storage space in the smaller second bedroom. 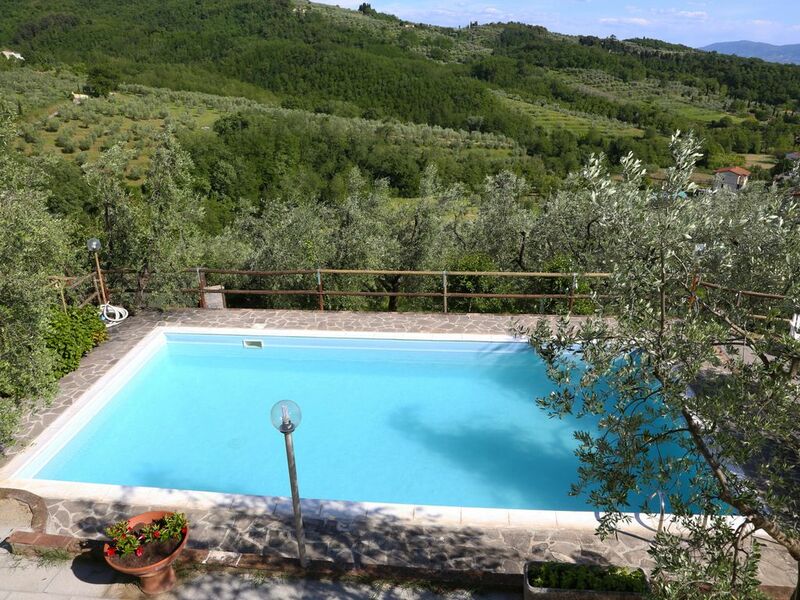 The pool is fabulous and a real asset to the property even if it does fall into the category of “lovely once you are in” as it can feel a bit chilly after you have baked in the Tuscan sunshine for a while. Stefano, Beatrice and their family are truly lovely people, on hand to help out if necessary but conscious of the privacy of their guests. Generous to a fault, you could not ask for nicer neighbours. A car is a must (make sure the horn works!) but be aware some local roads are steep, very narrow and some with blind turns, including the road leading to the Villa. For peace of mind, it is worth considering taking out additional damage insurance for your hire car but arrange this before you travel rather than taking the unnecessarily expensive ‘excess reduction’ insurances offered by the car hire companies. Pistoia is a lovely old town, well worth a sightseeing trip or two in itself. It has plenty of shops, cafes, gelateria etc. Of the local supermarkets we think that the Co-Op and the Conad Superstore are the best. Pistoia is on the main rail line between Pisa and Florence which makes it ideal for exploring near and far. You can get to Florence in 30 – 50 minutes and Pisa in about the same amount of time. Should you wish, you can get to Venice or Rome in 2 – 3 hours. There is ample parking in Pistoia and the car park nearest to the station (Parcheggio Cavallotti) only costs 2 euro all day. Other than to get some shopping in you wouldn’t really need to leave the Villa if you didn’t want to, spending days by the pool, watching the birds of prey as they ride the thermals off the hills, distant church bells cascading around the valley marking time that has slowed to a snail’s pace, evenings spent sitting on the terrace listening to the local stag population bellowing in the forest as the lights of Pistoia twinkle in the distance. Did we have a great holiday? You bet. great pool' good location and fantastic views. We had a lovely week at this Villa. The pool, the views, the owners and the location contributed to a happy holiday for our family. Stefano and Beatrice were great hosts - very generous and very discreet. As in other reviews we would agree the villa is functional and basic. If weather was really hot then the lack of a fan or air-con may be an issue however it was slightly cooler than normal when we stayed so we didn't mind too much. The views of the surrounding area are just gorgeous and having our meals on the terrace over the pool was just what we wanted from this holiday. We were easily able to visit Florence, Lucca and Montetacini, and the journey from Pisa was swift. Although directions sent were a bit vague - so you'll need google maps or sat-nav. Over-all this is a gem - a great taste of Italy off the beaten track. The Tuscan coast has many resorts, notably Viareggio which is an hours drive. Nearest airports are Pisa and Florence which are around 60 minutes drive. There's a good train service to Pistoia from Pisa or nearby Florence. Casa Martinelli is in the small village of Valdibrana, situated above the historic city of Pistoia, 9 km from the city centre. Pistoia itself is around 30 km west of Florence, and within easy distance of the 'Art' cities of Pisa and Lucca. The immediate surrounding area is notable for its production of highest quality Tuscan olive oil, and the proprietor has won several prizes for his.....definitely a house for olive oil enthusiast! Pistoia has a medieval centre, with an impressive town wall, a magnificent duomo, baptistery, Dukes Palace and interesting medieval public buildings. The old city is an excellent shopping centre, with a great market, fine restaurants and cafe bars. Outlet shopping with some of the most famous labels in the world is nearby. There are several artistic and cultural events held during the year, notably the Pistoia Blues festival and 'Joust of the Bear' festival.